Often described as the "Finest Walk in the World". 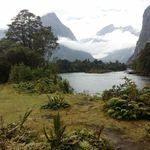 A 55 km moderate four day tramp, with up to seven hours walking on some of the days. 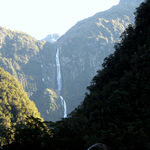 It is a four day (three night) back to nature adventure through the spectacular scenery of Fiordland. 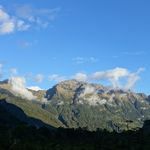 The track starts at the head of Lake Te Anau, follows up the Clinton Valley over Mackinnon Pass (1,100m) and then down the Arthur River to Milford Sound. 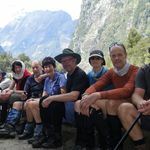 A good standard of tramping fitness and equipment is required - you will need to walk 14 to 18 km a day, carry an 11-12kg pack over rocky surfaces with some stiff climbs and descents. 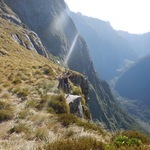 Those with knee or hip problems could suffer on the long rough descent from MacKinnon Pass. Weather can vary from glorious sunshine to torrential rain and blizzards. We use the three DoC Huts on the track. They are roomy, warm and comfortable, with open plan bunkrooms with good mattresses, gas cookers, flush toilets, but no showers. 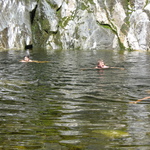 (Plenty of good swimming holes!) 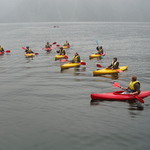 We take 40 people on each trip, which is the maximum number DoC allow in each day. We supply the food, but you help to carry and cook it. 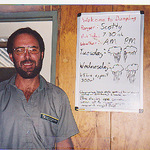 We leave the Leviathan Hotel, Dunedin by chartered bus at 6:30am on the first day, and return about 10pm on the fourth day, or 6pm on the fifth day for the “Special” trips. (see below). On our "STANDARD" trips, on arrival at Milford Sound after our tramp, we board our Bus at 3pm and return to Dunedin about 10 pm. 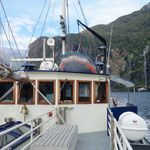 On the "SPECIAL TRIPS", when we arrive at Milford Sound after our tramp, we board the boat 'Milford Wanderer' at 4.30pm, and spend that night on the boat, cruising the majestic Milford Sound, with opportunities to go kayaking, swimming, learn about the geology of the area or just relax on board. 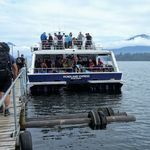 This boat trip is the perfect end to your tramp, with hot showers, good meals and no sleeping bag required! Returning to Milford township at 9.15am next morning to catch the bus back to Dunedin. People wishing to catch LATE flights back north next day, can be dropped off at Dunedin Airport about 6pm. These special trips will cost extra for Adults, and for children (under 15).